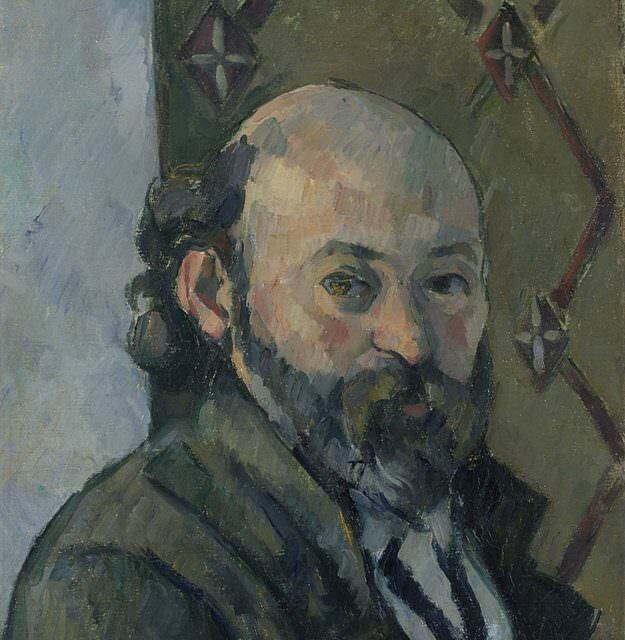 In painting his self-portraits Cezanne gradually integrated the head into the background of the painting so that the face lost its compactness. The convex roundness of the head changed into a flat area. The decor acquired a geometrical aspect and gained in plastic presence. Between the model and the wall space diminished. As Pierre Francastel writes, "We can see background and figure on the same level. They are on the same plane of interest, at the same psychic distance from the spectator." The psychological record becomes less precise for the benefit of a deliberately inexpressive and stereometric conception of the human figure. Cezanne painted more than thirty self-portraits. A single-minded man, entirely devoted to his task, nevertheless he was not lacking in humor. Monet tells how one day at the Cafe Guerbois he shook hands with everyone except the elegant Édouard Manet, saying, "I shall not shake your hand, Monsieur Manet, I have not washed for eight days." Misunderstood, constantly wavering between modesty and pride, still considered in 1887 "an artist with sickly retinas," as Huysmans called him, Cezanne saw his influence on the new generation gradually supplant that of all other artists. Five days before his death, he wrote to his son in his aggressive and fiery style, "Compared with me all my fellow artists are a bunch of idiots. ... I find that young painters are much more intelligent than the others; as far as the old ones are concerned, I am nothing more than a disastrous rival."